For a lot of us, there is something deeply sentimental, and maybe even terribly romantic about watching a movie outdoors. Where does this come from? Maybe from a recollection of a family movie night in the backyard, snuggled warmly under blankets covered in popcorn – or from the gone-by memory of a drive-in necking session with a former sweetheart. 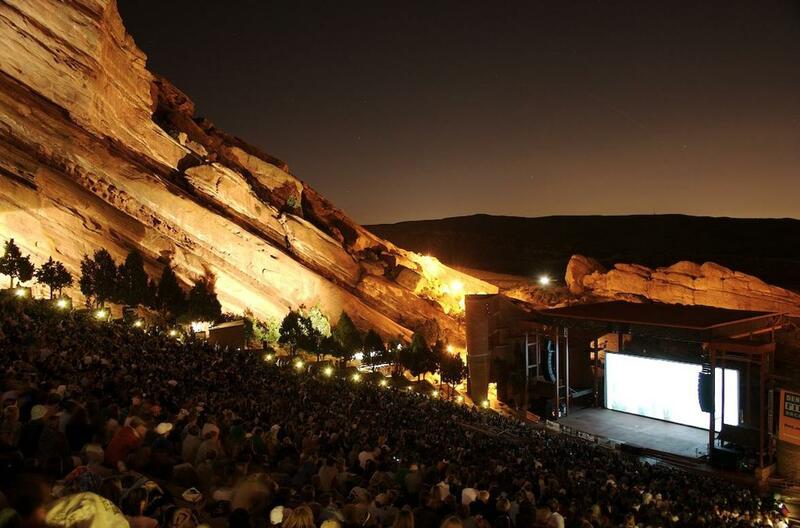 Whatever the reason, we think an outdoor movie is just a pretty darn novel idea. It's like going to the movies and camping at the same time – and at the end of the night, your shoes won't get stuck to floors sticky with spilled soda and candy, and nobody has to sleep on the ground. It really is the best of both worlds. We have found 30 places from all over the world that have taken this notion to heart and put some unique spins on the open air cinema experience. They have really tickled our nostalgia bones, so be prepared for some warm and fuzzies. 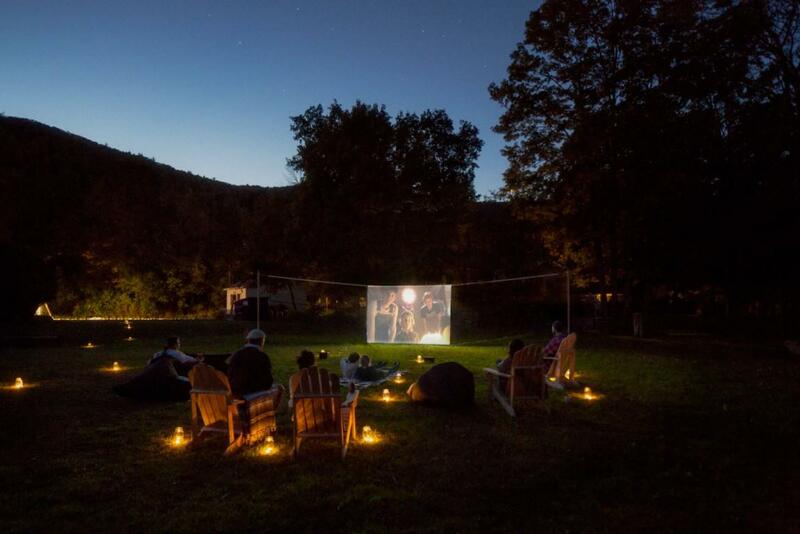 This roundup is dedicated to getting out and gathering in communties across the globe to watch movies under the stars. If your summer plans are not taking you outside of your hometown, Urban Outfitters came up with the perfect insta-gorgeous outdoor cinema DIY that you can recreate in your own backyard. Make sure to buy some festive pool floats for guests to lounge on and a few glow pool balls for ambiance! See all of the DIY details here. Alamo Drafthouse Cinema takes the outdoor film experience very seriously. 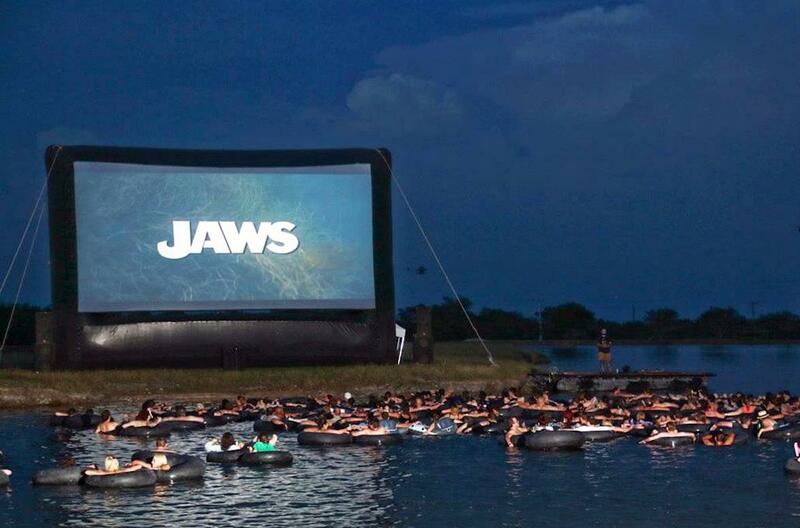 Last year their Rolling Roadshow series featured Jaws on a big screen in the middle of a Texas lake as 750 guests watched afloat from inner tubes. It was so much fun that they decided to revisit Lady Bird Lake, this time on a boat, to host the Off-Centered Film Festival event: The Ye Olde VIP Boat Party. Enjoy Dogfish Head micro brews, food by Antonelli's Cheese & Easy Tiger, and vinyl jams from DJ Gross Yall. Get tickets while you still can! 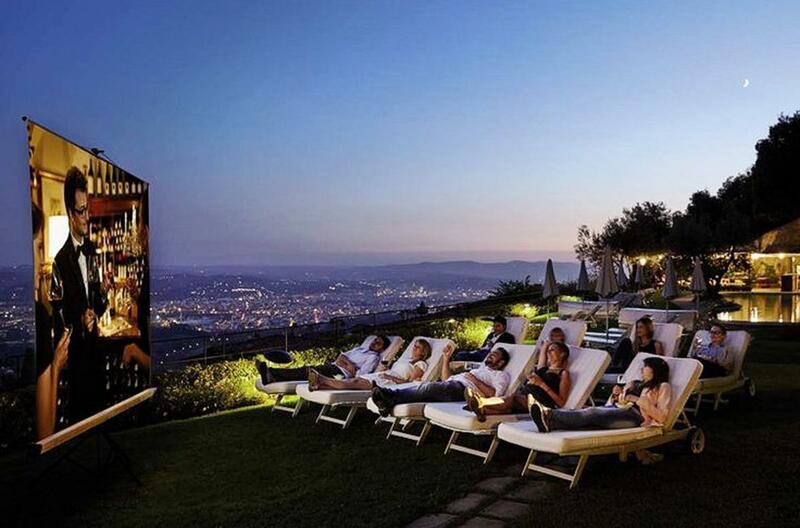 What's better than watching a movie outdoors with a few of your closest friends? 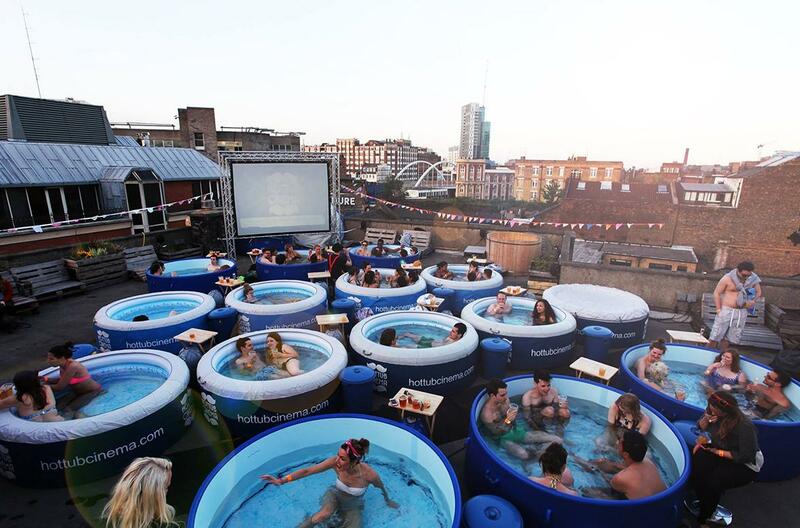 Watching a movie outdoors with a few of your closest friends in a hot tub, of course! Reserve a full tub (30 tubs in total) for up to six of your best buds, or share a tub and make some new friends – either way, it's hot, it's bubbly, and it's a fantastically different cinematic experience to say the least. Now showing in NYC, London, and Ibiza – grab a tub while it's still hot! 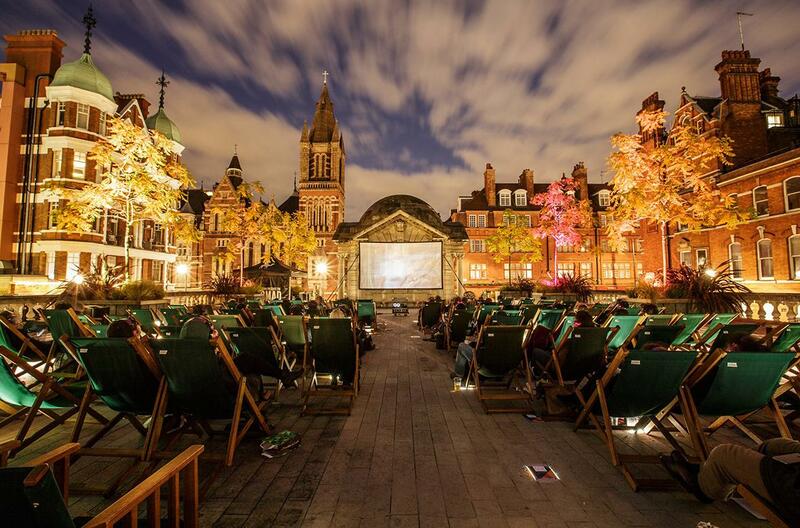 The Nomad Cinema's traveling pop-up outdoor movie operation in London has got it all going on. 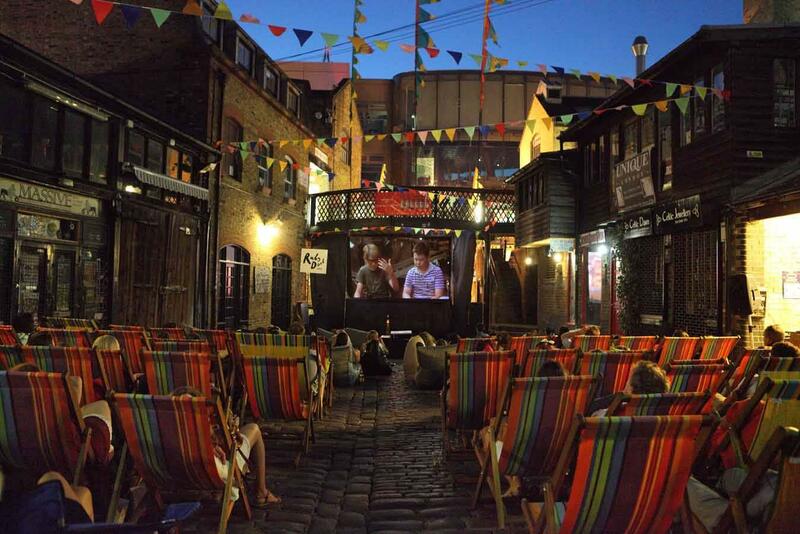 They show up at a beautiful location somewhere in the UK, pair with some of the area's premier food and drink establishments, screen a classic movie for the public, and then disappear into the night without leaving a trace? The best part: all of their proceeds go to charity. Brilliant! Get tickets here. 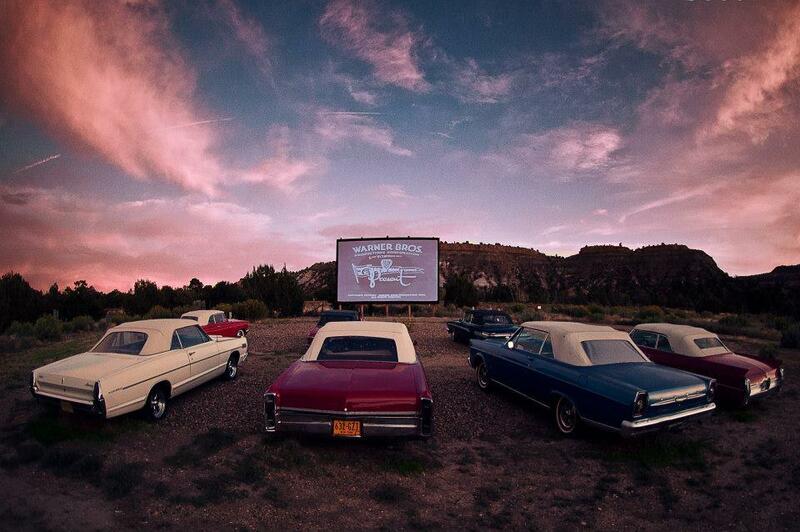 We would love to be stranded at this drive-in! Shooting Star RV Resort in Escalante, UT invites you to throw it back every Tuesday, Thursday, and Saturday evening at their old school outdoor movie theater. Bring your own blanket or chairs to lounge on, OR reserve one of their classic 1960's convertibles if you're looking to achieve an optimal vintage viewing experience. Oh, and if you plan on staying a while, you're welcome to bring your own RV or rent one of their righteous Airstream trailers (decked out in old Hollywood decor). 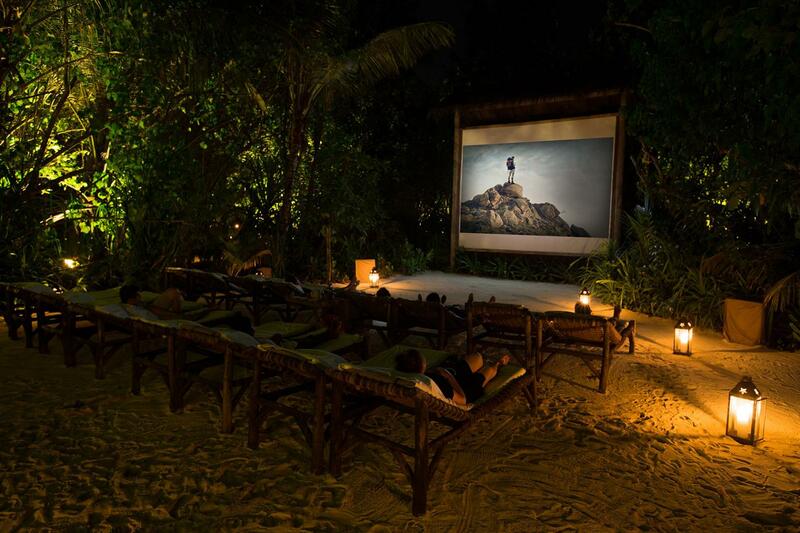 Lay back on a comfy lounge chair, listen to the gentle crash of ocean waves, feel the ocean breeze on your skin, and enjoy classic cinema every night of the week at this paradisaical outdoor beach cinema at this jungle cinema on a beautiful island resort in the Maldives. 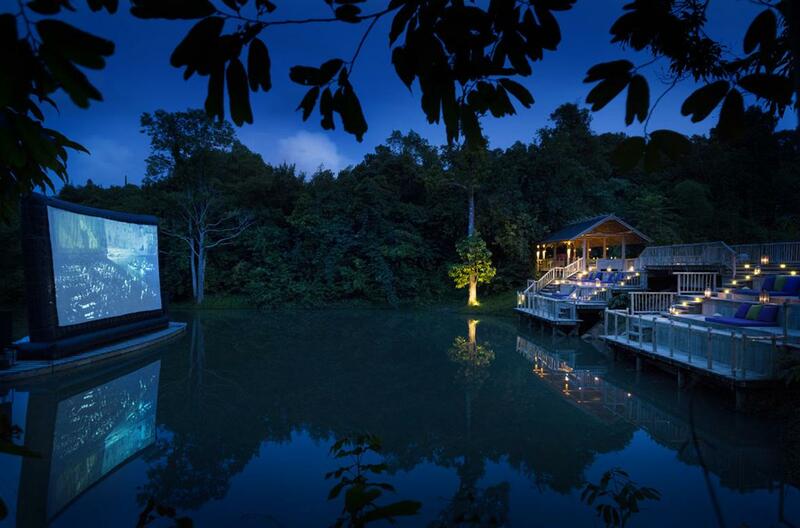 This 'Jungle Cinema' is the ultimate movie/dining experience. With over 3 acres of activities featuring a swimming pool, hammocks to lounge in, a badminton court, a fire pit, picnic area, bikes to explore on and plenty of places to relax with a cocktail, this place is prime for the perfect weekend getaway. On Saturday nights the lawn & vollywball court gets turned into an outdoor cinema. Roll out a blanket and watch a movie under the stars! 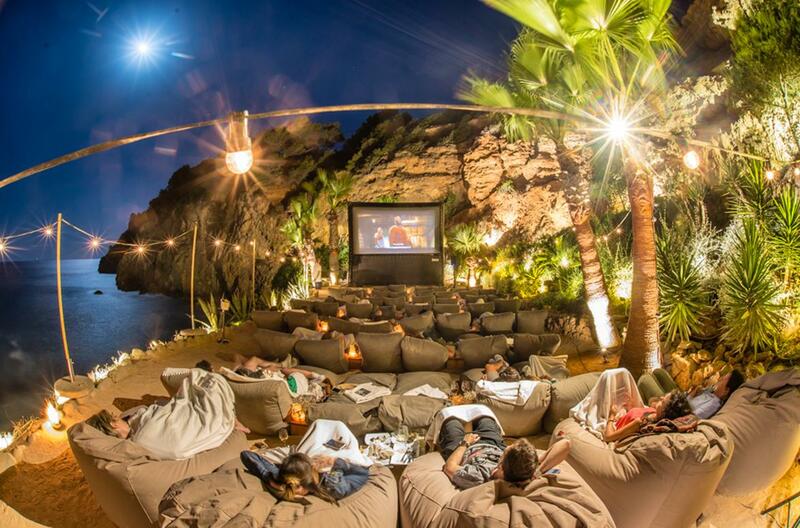 Amante is the home of one of the most beautiful and atmospheric open air cinemas in the world. Not only that but they've got possibly some of the best seating... in the world. The floodlit rocks, star filled sky and gentle lapping waves provide a unique backdrop to enhance the experience of some great modern and classic movies. The seating consists of the comfiest full length bean bags, and blankets are available for those that want to snuggle up. Waiting staff provide a popcorn and drinks service. For those looking to relax with a glass of vino, Jean Leon Wines are also served. Get tickets here. 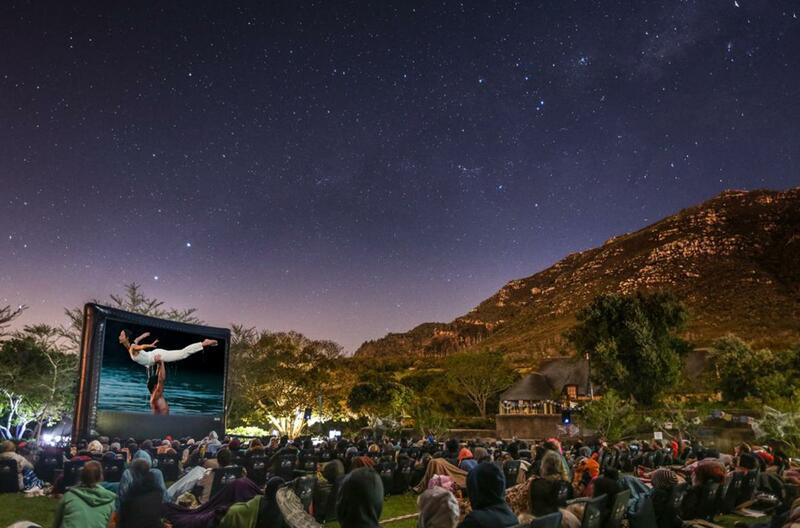 Come enjoy some cinematic classics on giant inflatable screen under an umbrella of South African stars at The Galileo Open Air Cinema's latest installment. With screenings in a variety of locations and a market at each to appease your artisan food and drink needs, this one is a dead ringer for a good time. Find a venue near you and get out there under the night sky! Get tickets here. Dokufest was created in 2002 by a group of friends who started with almost no funding. It has since developed into a cultural event that attracts international and regional artists and audiences and is set at some visually stunning locations, such as the Castle Theatre which is built on a platform on the mountain top with the castle ramparts above. Films are screened throughout the eight-day festival along with numerous programs, activities and workshops. 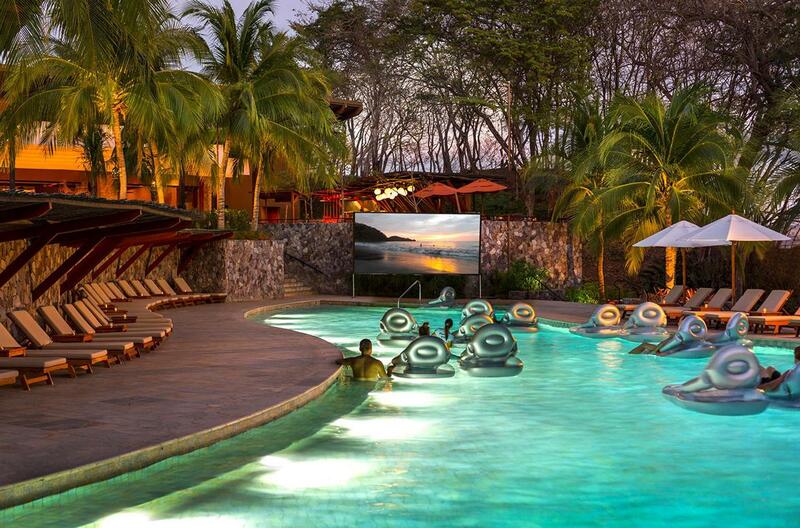 How does a Friday night movie sound... in the pool the Four Seasons Resort in Costa Rica? If it sounds as good as you think it does (and it is), you'll want to pack up your posse, pull up your favorite floaty and kick back for a little pura vida in paradise. The resort itself is a Pacific coast hillside oasis, overlooking two golden sand beaches - the only five star resort in Central and South America. 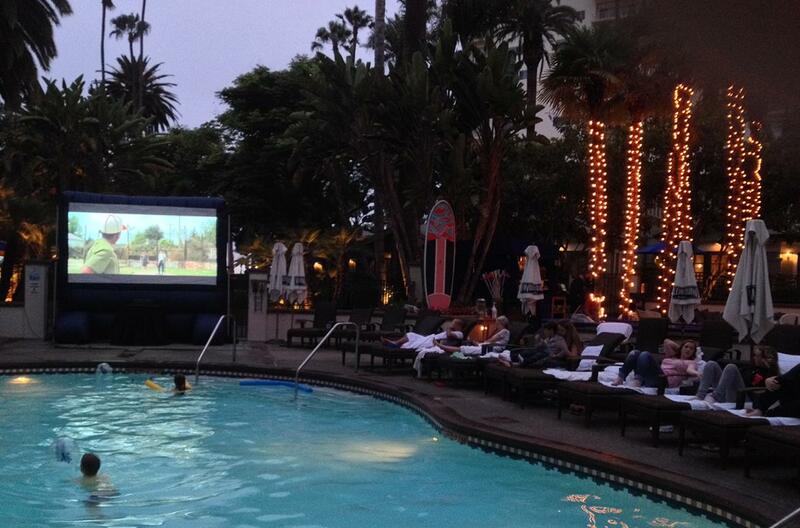 Think poolside movie night with a side of eco-adventure, luxury spa and world-class accommodations. 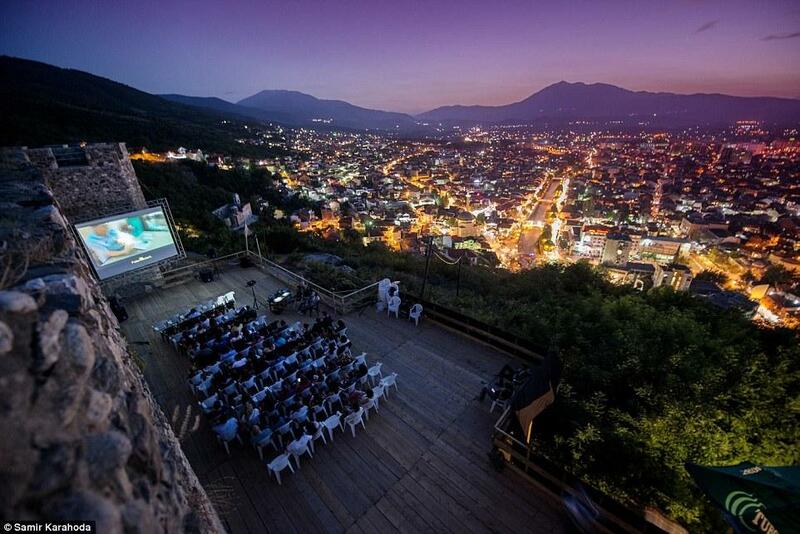 Belmond Villa San Michele recently unveiled a brand new open-air cinema located alongside its panoramic swimming pool. With a breathtaking view over Florence, guests can sit back and relax in an unforgettable setting. Additionally, a weekly event will be dedicated to kids only, where the hotels younger guests will have fun indulging in pizza and popcorn while enjoying their favorite cartoons on the big screen. Ever wish you were watching a Hollywood classic on an inflatable screen in the middle of an untamed jungle? 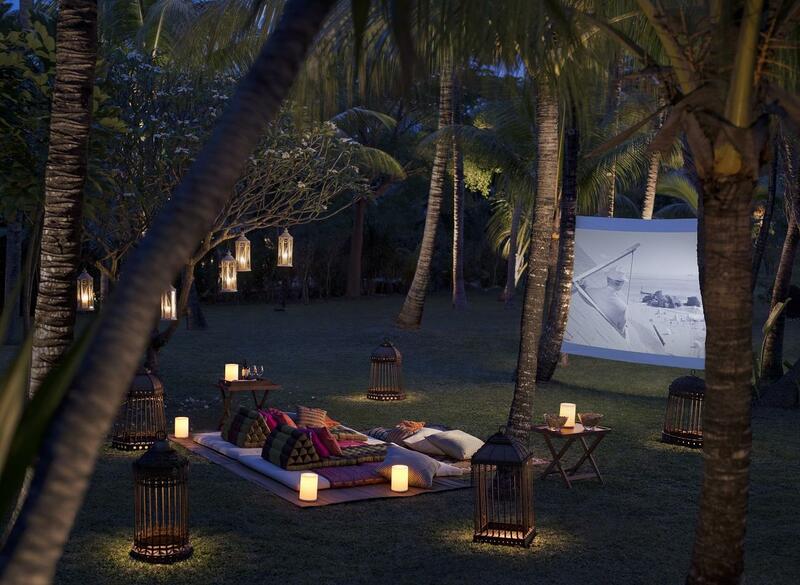 Cinema Paradiso at Soneva Kiri in Koh Kood, Thailand can make that wish come true on a nightly basis. Enjoy gourmet munchies and an array of craft cocktails as you relax with one of your fave classic flicks at nightly screenings in their jungle-cloaked, open-air theater. 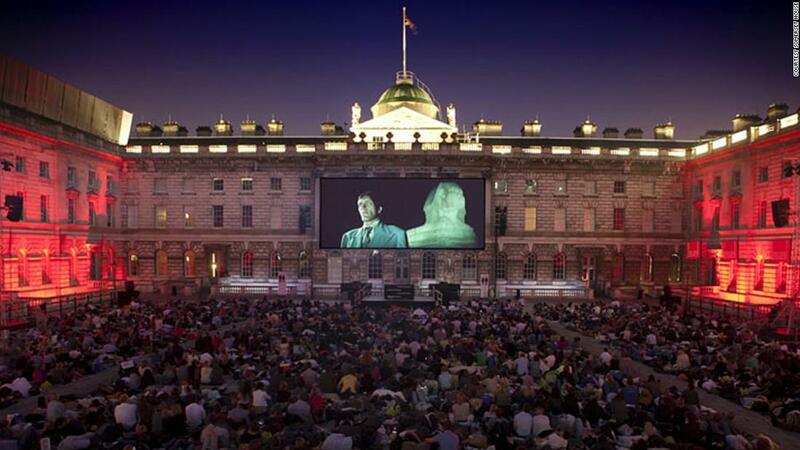 Somerset House's open-air film series is back again this coming August, screening forthcoming feature films, contemporary classics, and cult faves all projected in 35mm film onto the largest outdoor screen in London. You can also expect behind the scene talks from industry talent as well as DJ sets inspired by the coinciding film scores. This years films include: Trainspotting, Ex Machina, Sunset Boulevard, and Bram Stoker's Dracula. Don't miss out! This famed 19th century mansion gives new meaning to "Turkish Delight." 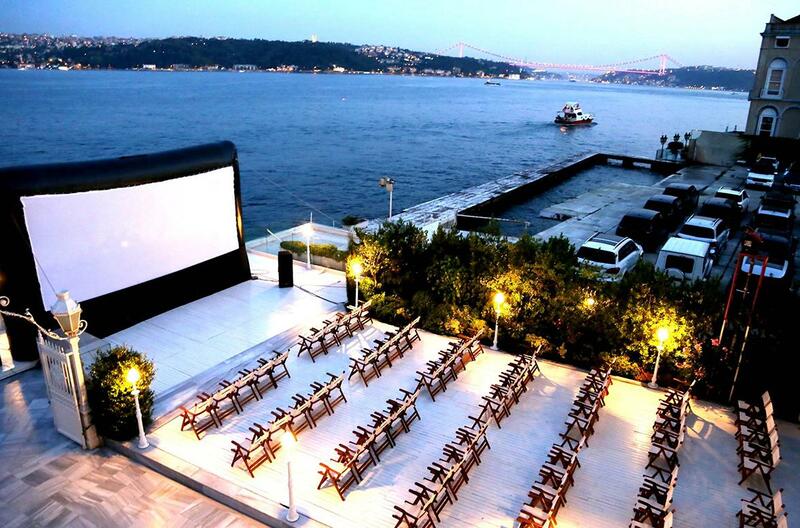 Located in bustling Istanbul on the edge of the Bosphorus Sea, Sait Halim Pasa Mansion embodies elegance and oppulance and hosts Istanbul's coolest outdoor cinema every summer. The starry nights begins with delicacies and cocktails served on the seafront, and continues with the screening of the season's most popular movies ... with the Bosphorus as a backdrop. 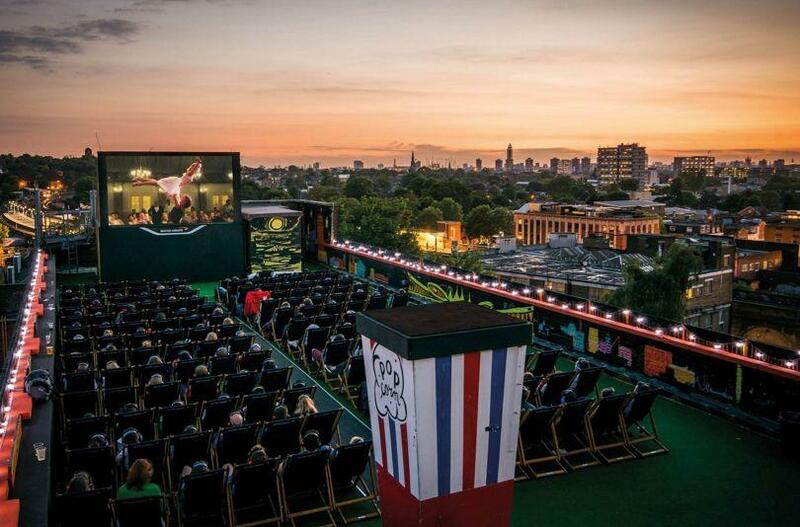 Fancy a movie under the stars on London’s most scenic rooftops? 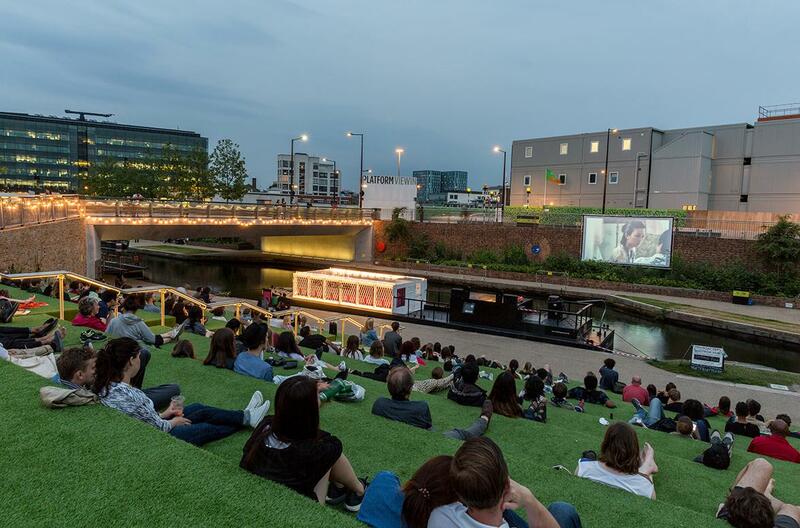 Well, Rooftop Film Club offers outdoor film screenings complemented by beautiful skyline views at five different elevated venues across the capital: Bussey Building at Peckham Rye; the Roof East urban park; Queen of Hoxton in Shoreditch; Kensington Roof Gardens; and Tobacco Dock. No matter the location, movies range from cult and classic to new releases, and are complemented by excellent food & drink. Wherefore art thou, one-of-a-kind live cinematic experience? Ok, we'll tell you. It's at St. Mary's Church in Marylebone, June 3-4. To mark the 20th anniversary of Baz Luhrmann's Romeo and Juliet, Backyard Cinema has decided to once again screen the film at idyllic St. Mary's Church. Come watch the greatest love story ever by flickering candle light under the moonlit stained glass windows, and listen as the Some Voices Choir accompanies the much lauded soundtrack. This one is not to be missed! Tickets available here. 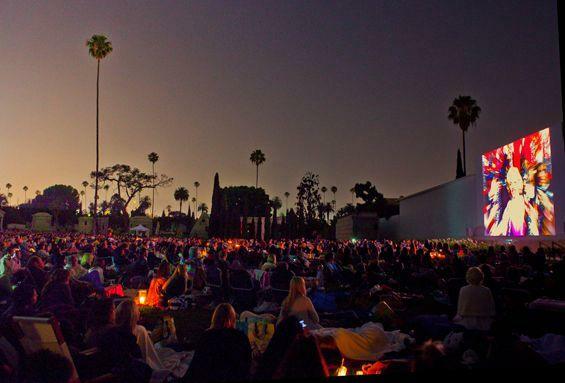 Watch some of the finest films ever to come out of Hollywood in a cemetery that is home to some of the filmmakers and stars that made them famous at Cinespa's slightly morbid and famously awesome yearly outdoor film series beginning in May and running through the end of the summer. Bring a picnic, enjoy pre-show DJ sets, and keep your eyes peeled for famous faces, as this Hollywood institution is frequented by stars and filmmakers. Bring your bests for the girls getaway of the century and have movie night overlooking the Mediterranean Sea. Perched on the rocky cliffs of Es Cubells, on the island of Ibiza, Villa Atlantis features beautiful views of the Mediterranean Sea and its own private beach. Set on over 3 floors, the exquisitely designed property offers luxury accommodation in 7 en-suite bedrooms, appointed with stylish decor, plush bedding, and Wi-Fi and some of the units can be connected to accommodate larger groups. 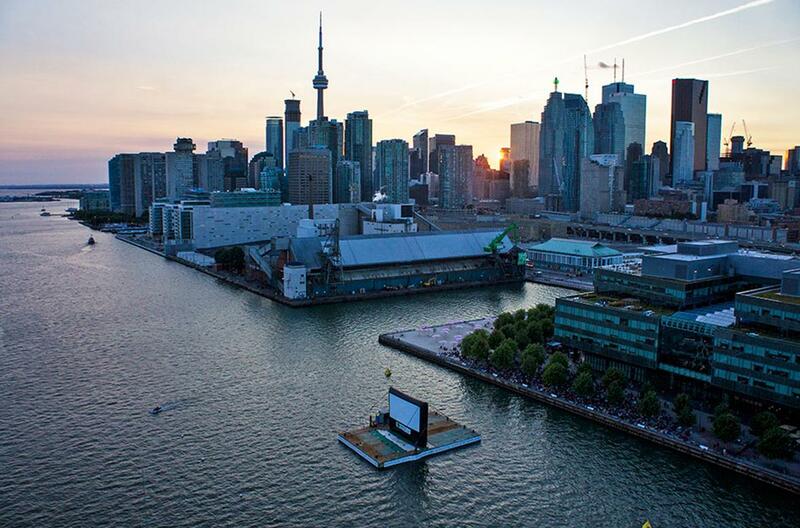 PortsToronto presents Sail-In Cinema™, the world’s first two-sided floating movie experience. On August 18-20, 2016 Canada’s Sugar Beach will transform into Toronto’s largest outdoor theatre. Movies will be shown under the open skies on a two-sided screen set atop a barge in Toronto Harbour. You can watch movies for free from Sugar Beach or Lake Ontario. If you’ve got your sea legs, you can come to the movies by boat and drop anchor. If you’re a landlubber, bring a chair, a cushion or a picnic blanket. For more info click here. It's probably been way too long since you had a moonlit picnic under the stars. Well, there's good news if you're in London. 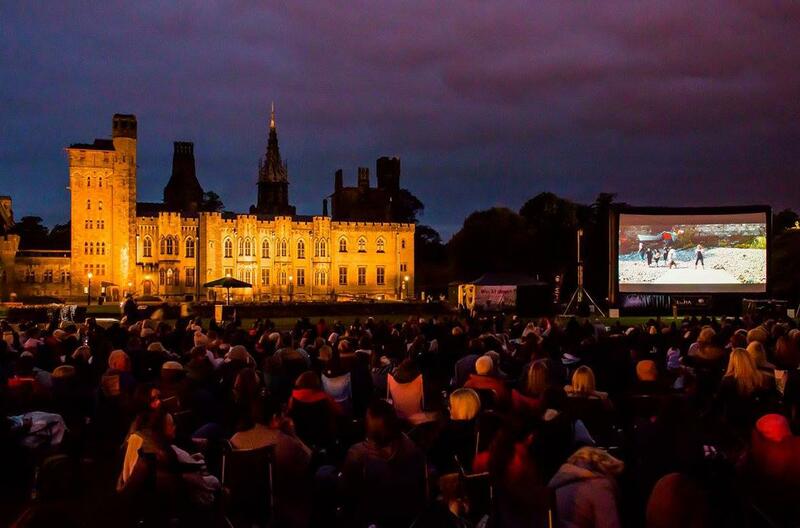 The Luna Cinema has staged hundreds of open air cinemas at venues like London parks, castles, and country manor houses and they will continue to do so this season. Grab a blanket, a few of your nearest and dearest, some snacks, and come enjoy a classic film on a big screen at some of the most beautiful and prestigious settings in the UK. Buy tickets here. 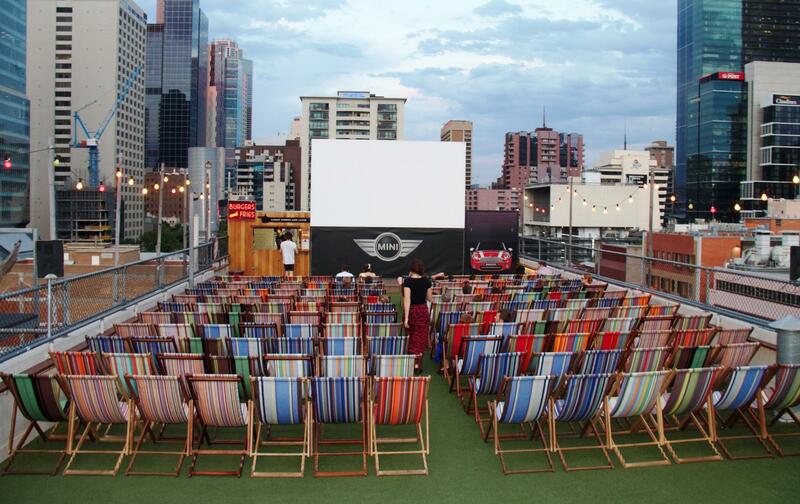 Rooftop Cinema, a cinema on a roof in the heart of Melbourne is owned and operated by a sharp team of creative minds and is built to be an urban idyll, a complete contrast to the noise, bustle and crowds of the city. Grab one of the Ici et La seats up on the roof as you have the sky above you, the grass beneath you, and a film and the Melbourne skyline in front of you. Rooftop Cinema is committed to showcasing arthouse, classic and recent release films in a completely unique urban environment. Running December 2016-April 2017, also bookable for groups & corporate! The Floating Cinema is an award winning architectural structure that brings programmes of film and expanded cinema events tailored to the canals and rivers it visits in London & the UK. UP Projects created The Floating Cinema in 2013 designed by award winning Duggan Morris Architects. The Floating Cinema is an extraordinary floating structure, a mobile arts venue and cinema that navigates the waterways of London and the UK. Floating Cinema events vary in size from intimate floating tours for 12, on-board screenings, workshops and talks for up to 20 people, to large-scale outdoor screenings for audiences of 500+. Can you imagine a night on this floating cinematic boat with 12 of your bests? Hello best night ever. 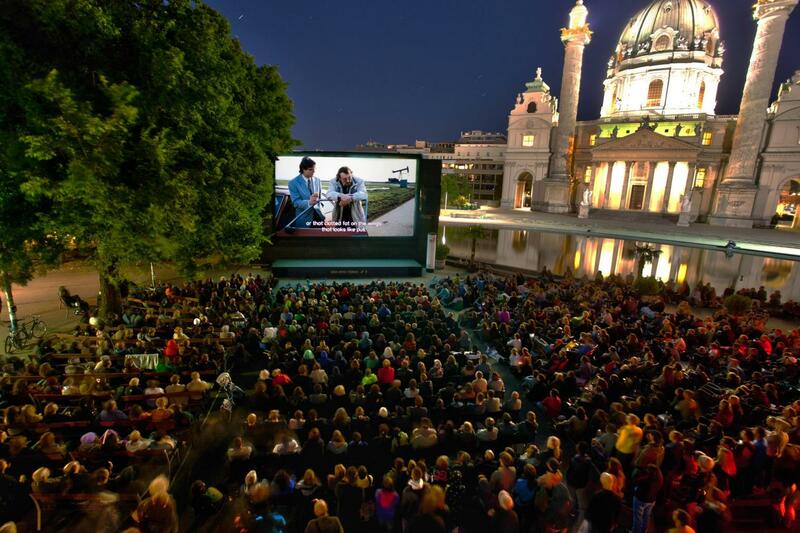 Summer in Vienna comes with daily outdoor screenings at Karlsplatz. Throughout the month of July, Kino Unter den Sternen (Cinema Under the Stars) invites cinephiles to watch classics and independent films in the shadow of Karlskirche (St. Charles’s Church). Movies are usually shown in German and English, and admission is free. 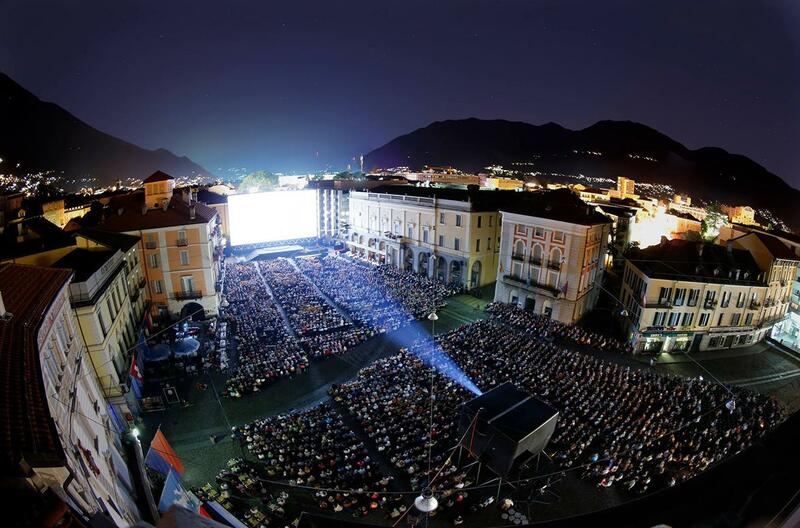 Each August, the world-famous Locarno Film Festival transforms the city’s marvelous Piazza Grande into Europe’s largest open-air cinema, with seats for 8,000 guests. The enormous screen and state-of-the-art sound along with fabulous film choice and elegant architecture make this esteemed Swiss film festival a truly one-of-a-kind cinematic experience. Looking for an out-of-the-box evening at one of the most beautiful hotels in Beverly Hills? Join Mr. C Beverly Hills for an evening of dinner, cocktails, candy, popcorn, film and fun. Movie starts promptly at sunset, doors open at 7pm. Relax on chic, comfortable loungers and pre-reserve your seats by purchasing in advance a Mr. C Cinema Pre-fixe Menus ($35 or $45 per person) featuring Cipriani classics, yummy cocktails, crisp Peroni Nastro Azzurro, and fresh popped popcorn. Call 310.226.6245 or email restaurantbh@mrchotels.com reserve your spot today! Every other Tuesday beginning in June, click here for full schedule. After an extensive six-month renovation, Shangri-La’s Le Touessrok Resort & Spa, Mauritius, has reopened as of November 2015. Nestled along the untouched eastern coast of the beautiful island, every room features uninterrupted, postcard-perfect views of sparkling, turquoise waters and embodies sophistication and style. In addition to fashionable restaurants, bars and entertainment venues that are set against the backdrop of a dramatic tropical landscape and offer bespoke experiences and luxurious indulgences, Shangri-La's Le Touessrok Resort & Spa, Mauritius, also offers a beautifully bespoke outdoor cinematic experience near the beach. Can't beat that. 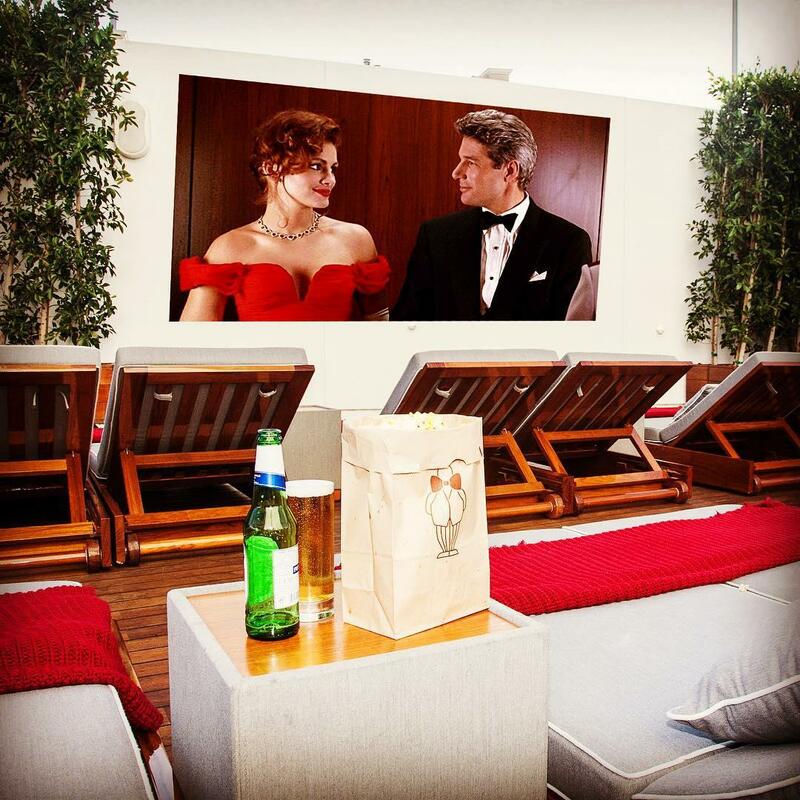 This summer Fairmont Miramar Hotel and Bungalows will be hosting a classic outdoor movie screening every Friday at 8pm at the Miramar Pool Club. Both hotel guests and visitors are encouraged to come and enjoy family-friendly movies while they float in the pool or relax in a lounge chair while enjoying complimentary popcorn and a special poolside menu. 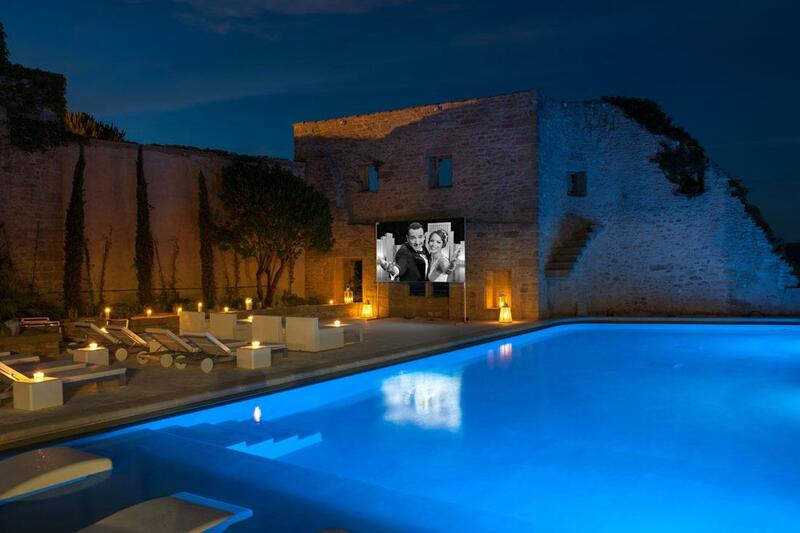 Imagine floating in a "dive-in" cinema in a pool, located in a mansion within an authentic medieval village. Le Vieux Castillon is really a unique and magical place for a stay full of charm and luxury. Surrounded by cypress and olive trees, symbols of Provence enjoy popcorn, ice-cream, and other sweets as you're invited to experience a new, cinematic experience. 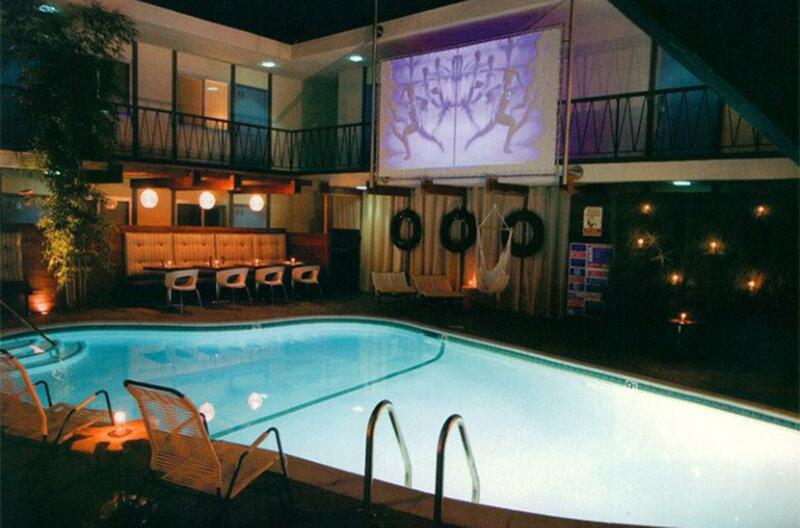 Every night, international film classics as well as new films are projected alongside the pool for your enjoyment! 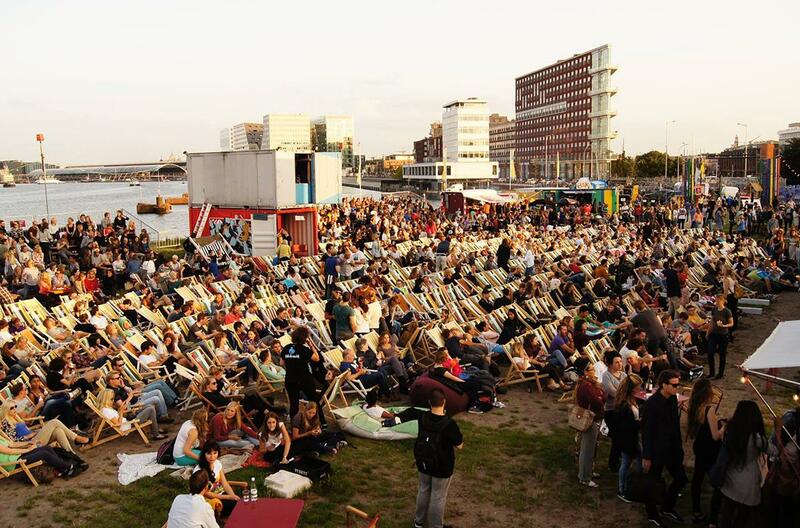 Held every summer in Amsterdam, Pluk de Nacht (Seize the Night) is the biggest open-air film festival in the Netherlands. It enjoys an idyllic waterside location at Stenen Hoofd pier, and the film schedule is always a surprising mix of experimental shorts, documentaries, and unreleased indie films. Admission is free, with beach chairs and blankets provided. There’s also a bar and food trucks on the premises, sounds pretty sweet to us. 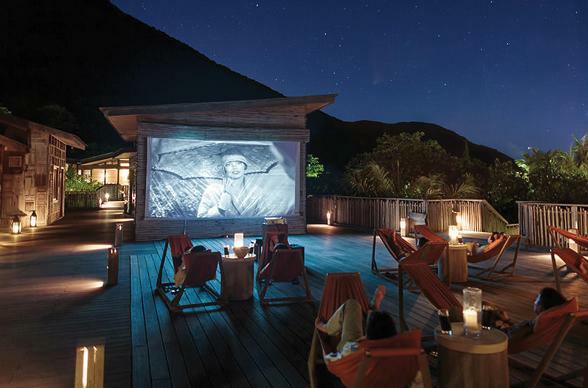 Song Saa Private Island ensures you're living in the utmost lap of luxury, as they'll host a private film night right on the deck of your villa, projected onto a sail screen. 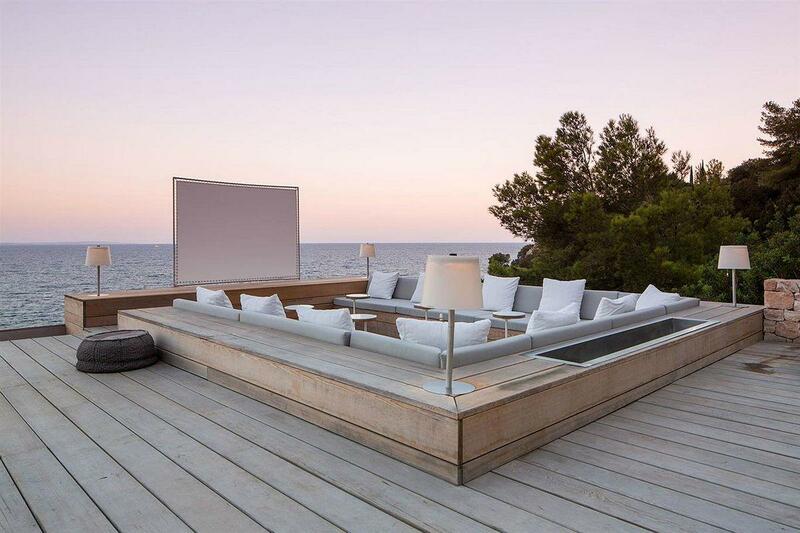 So if you’ve got an ocean view villa you can watch a film with a backdrop of the ocean! 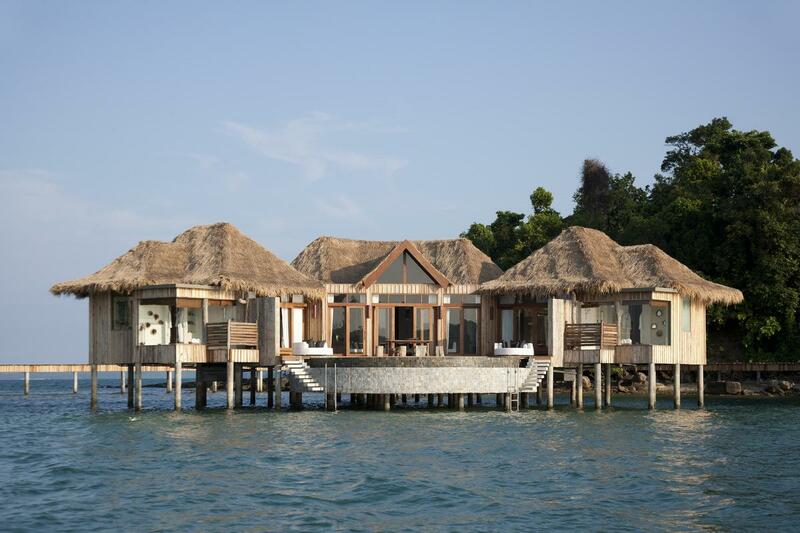 Set on two unspoilt private islands connected by a wooden footbridge, this wonderfully romantic retreat is one of Cambodia's finest resorts. Ok, who doesn't love curling up in bed with a good movie? That's just the feeling The PicNic Cinema in Sydney has captured with their snuggle-rich, naptastic outdoor bed cinema. 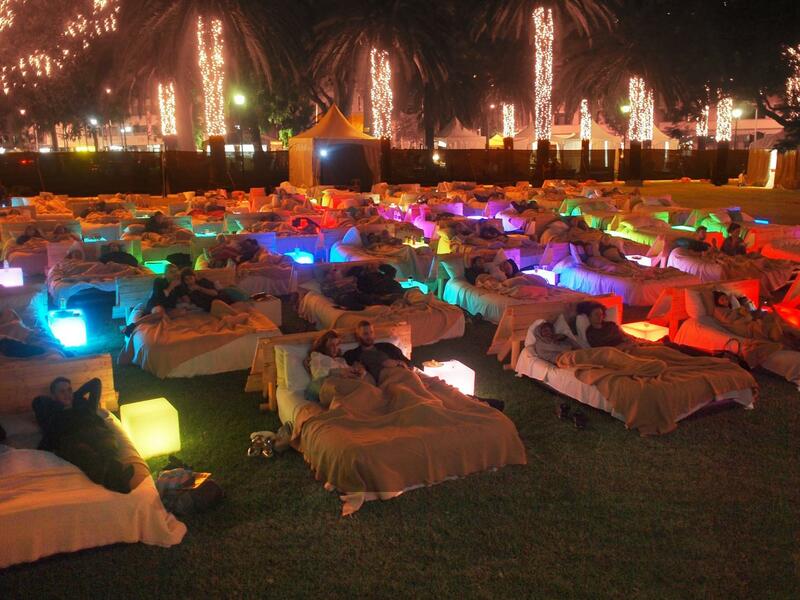 Get real comfy on one of their 100 reservation only bed spots, or just bring a blanket and watch from the grass. There will be food from over 20 pop-up restaurants and live music also, so bring your appetite along with some dancing shoes (maybe a pair of PJ's?). Ssssshhhhhhhh! Let's keep this one on the down-low. With 45 productions under their belt to date, Secret Cinema has built up around 15 acres of private, gated land for their exclusive, unparallelled cinematic experiences. 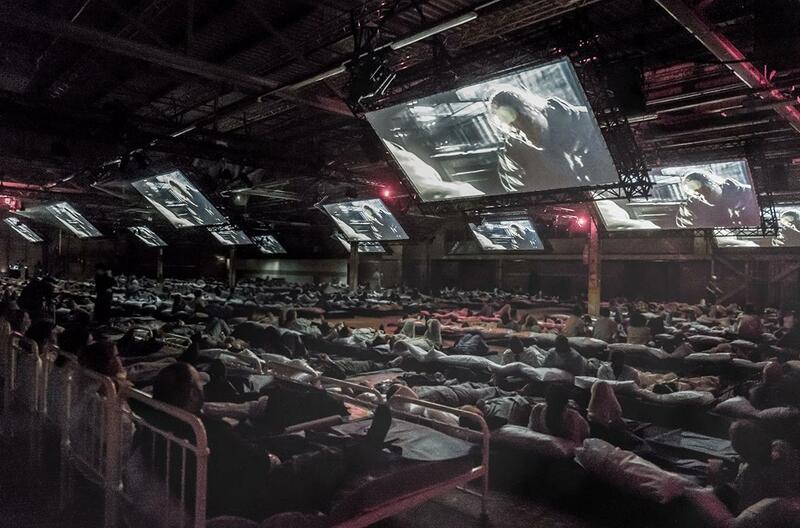 They have created a horrifying 360 degree apocalyptic experience for their showing of 28 Days Later in April and May (including epic custom-built sets and live actors). For their July screenings of Dirty Dancing, they have recreated the Kellerman's Catskills holiday resort – complete with live dancing. All held at secret London area locations. Tickets available here.